OUR UNIQUE COMBINATION POCKET-AND-WINDOW-IN-ONE DISPLAYS YOUR AIRWORTHINESS CERTIFICATE WHILE KEEPING IT SAFELY STORED INSIDE THE POUCH. MADE IN USA Two compartments hold the rest of your papers, logs, pens, bean bags, you name it! Overall pouch dimensions are 9" x 12" x 2" deep. COLOR CHOICES FOR THIS ITEM: Dark Brown Royal Blue, Red, Navy Blue, Black, Maroon. FLIGHT PAPERS POUCH, Cordura nylon MADE IN USA #FPP 1 LB $59. HIGH DENSITY FOAM LINER HELPS PROTECT YOUR PASSENGERS FROM BANGING AGAINST SHARP STRIKERS AND TOOLS ON HARD LANDINGS. 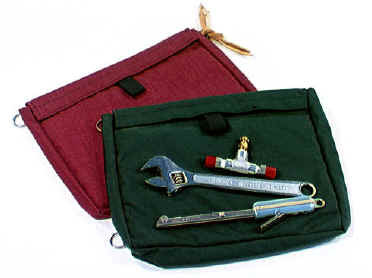 MADE IN USA Our standard tool pouch. Dimensions 9 inches tall by 12 inches wide by 2 inches deep. Perfect for a small assortment of on-board equipment. A great gift! Custom sizes available. PADDED TOOL POUCH, Cordura nylon MADE IN USA #PTP 1 LB $49.